What a difference eight years make! Back in March 2005 4-VEP unit 3447 stands at London Blackfriars on a rather gloomy day ready to work the 18:00 service to Ashford. A lot has changed since- For starters 2005 was the final year for the southern region slam door units. 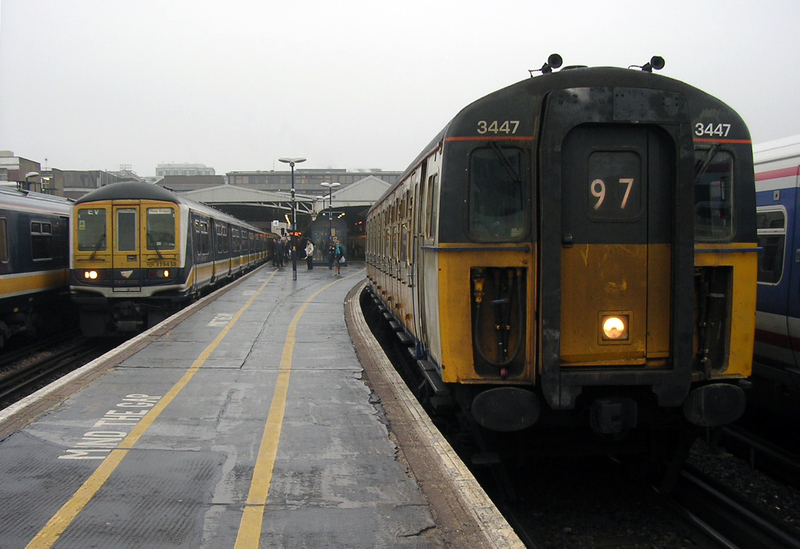 Since then the Thameslink franchise has been re-let resulting in the original Thameslink livery dissapearing on the class 319's as seen to the left. Network South East livery, just visible on a 'Networker' on the right has also finally been eliminated from the rails. Of course another major change has been the complete re-building of Blackfriars station itself- the station now spans the Thames and is covered for its entire length. The original station roof and buildings have been totally demolished. It is fair to say that somebody standing in this spot today would find this scene almost totally unrecognisable!